The basic relationship of functions and responsibilities among stakeholders can be defined by breaking down the basic design of a project and specifying the basic relationships with objects. To this end, elements, framework, and correlations for achievement of a project are organized as a scheme. 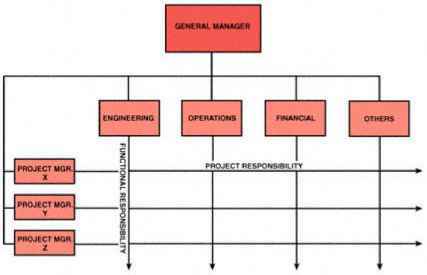 A project scheme is a conceptual structure that is reasonably presumed to be viable, where relationships are specified and responsibilities of involvement with a project and functions are clarified. These are depicted as a framework. Details of a scheme may change in the course of structuring. When viewed from an individual entity, an individual element can be one project, while for a sponsor (investor) who is a promoter, a project means creation and achievement of the framework for the whole project. A project scheme is a bird's-eye view of the framework of the overall project and serves as a road map. Needless to say, it will not necessarily function as the ultimate framework for a project. The concept of structuring refers to planning of the actualization of individual elements and the concurrent realization of the structure and composition of the total project by depicting the whole picture. 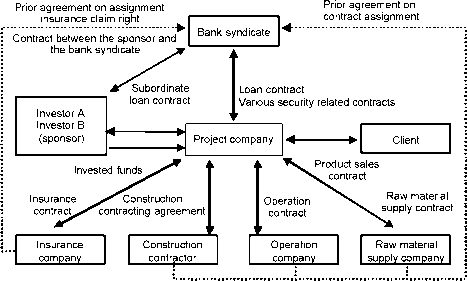 Note: Some projects may not have contracts in part (e.g., product sales contract), or some contract elements will be merged (e.g., the operation company takes charge of supply of raw materials, or the project company itself provides the materials). The above figure only shows an example.